Even though Sizawe looks, feels, acts and smells like a Ponzi scheme, we’re going to try to take as objective a look at it as possible. You see, it has lately become a trend for every pusher of every lowly Ponzi scheme, to contradict the obvious in our comment sections (not forgetting to add the compulsory affiliate link of course). Their main argument is “I got paid, so it’s legit.” Obviously, it’s part and parcel of pyramid scheming to pay a few early “clients,” so they spread the word and draw in fresh blood, without which the pyramid would collapse way too early. We have plenty of experience with such schemes and we see way past the stage where a few lucky affiliates pick up their payments. With that in mind, we’re going to start off the assumption that Sizawe is in fact a legitimate operation, and we’ll move on to listing the red flags and question marks which are highly indicative of a pyramid scheme. 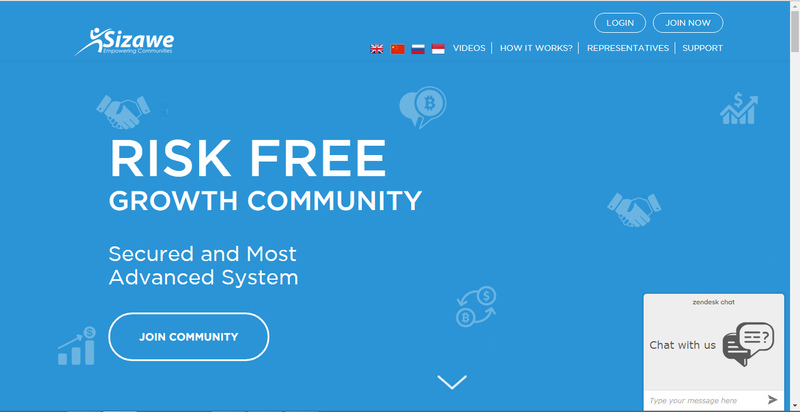 Sizawe proclaims itself a “Risk Free Growth Community” with a “Secured and Most Advanced System,” which it uses for something… it’s not obvious from the homepage what. It apparently uses some sort of an investment bot, which is fleetingly mentioned in the homepage copy. Exactly what this bot invests and where, is never really discussed. Much more focus is given to the multi-level affiliate reward structure, which seems to be the heart and soul of the operation. In addition to the investment angle mentioned above, Sizawe seems to peddle a sort of reciprocal help system too, which is about Providing Help to others and then Getting Help back from the community, interest and all. This interest can be as high as 50% or even 100% per month. At first glance, we thought the PHs and GHs used on the Sizawe website to describe their system, are Petahashes and Gigahashes, and we were properly confused, as nothing seemed to make any sense that way. We later realized though that PH was merely short for Providing Help (which is the equivalent of making a deposit with the operator) and GH meant Get Help (the equivalent of making a withdrawal). That cleared things up a little. Sizawe offers two investment “contracts” of sorts. The first Provide Help move one makes, has to be for a sum of $10-$5,000. The promised return rate on this PH is 50% per month. A member’s second PH has to be for a sum of $10-$2,500 and the return on this is 100% per month. In both cases, the Get Help (withdrawal) that one can request, is limited to $3,000 per day. 20% of one’s PH will be confirmed within 24-72 hours, which is when “the growth” is slated to begin. The remaining 80% of the investment will be confirmed within 1-2 weeks. When one re-commits, he/she has to invest at least as much as his/her previous PH amount. There’s no cutting back on the money-flow here. On the 50% return channel, one is compelled to re-commit at least 10%. On the 100% channel, this ratio is 20%. In addition to making money out of the blue like this, members can also rack up profits by bringing others into the scheme, according to an intricate, multi-layer plan, which awards various ranks to its participants, depending on their level of performance. While a person who convinces at least 10 others to join, is called a Volunteer, he who manages to get 10,000 members into the fold, will be known as a Role Model. The direct affiliate cut is 5% of the commitments and re-commitments made by the referred. The first level affiliate cut is 4% and so on, all the way down to 0.05% for the unlimited depth tier. In addition to all the above, members will be able to control their Sizawe bot, telling it when to commit and when to grow/withdraw, through Telegram. You can if you want to. Let’s just say though that we do not advise you to. The site copy features poor English. While some will say this does not mean much, we have found it to be a common denominator of most shady, Pyramid-based schemes we have reviewed. We do not know who is behind it all… Their “Representative” page is empty. For some reason, no one is willing to put his/her name on this. Again: the promised returns are 50% and 100% per month. That alone should make the true nature of this operation crystal clear. We have a textbook pyramid scheme in the referral-department. This could not possibly be clearer than that. Having spent a few hours investigating Sizawe, we have no idea how their revenues are generated. It is very likely they come directly from the referred people. The pictures used for the “community” on their homepage, are lifted from various dating sites and stock photo portals. We only checked the two women who are 2nd and 3rd from the left in the top row, but it is safe to assume the others are cut from a similar cloth. The domain was first registered in October, 2016. Unsurprisingly, the identity of the registrant is secret. For the registrant address, only a PO Box number is provided. With a SimilarWeb global rank of 241,277, Sizawe.com doesn’t seem to be too popular. However, it does receive a good amount of visitors, mostly from India, Nigeria, Indonesia, China and Australia. Verdict: Sizawe is a SCAM! Do you have any first hand information regarding Sizawe? Please share it with us by leaving a comment below.